Okay, back to the cupcakes — they’re just regular vanilla cupcakes (I used boxed mix) baked in red liners, frosted, and then dipped in oreo crumbs. For the ears, I used a small round cookie cutter to shave down the size of oreos so they were more proportional for a regular-sized cupcake (mini-oreos were too small). 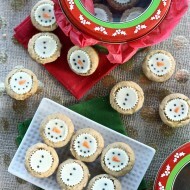 To attach them I stuck a tooth pick in the cream center of the cookie and snuggly attached them to the cupcake. 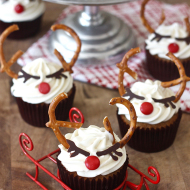 So if you make these, make sure to remind your guests to eat the ears first or they’ll get a mouth-full of toothpick! The white buttons are just chads I collected from my 3 hole punch, attached with glue after the cupcakes were baked. It’s definitely hard to readjust back into reality — I much prefer the Florida sunshine and magic of Disney to biostatistics and renal physiology (not to mention chillier temperatures in CT)! We really had a great time, everything was easy (even though the parks were packed), and most importantly — Scott had a great time. The trip was really all about him, but of course Ryan and I got our share of the magic too. Thanks Mom and Dad for the getaway! Very cute! I love the detail of the buttons on the wrapper. Aw, how cute! I agree, those details on the wrapper are perfect! 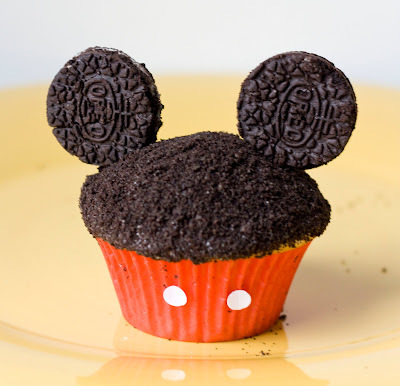 So cute..gonna have to make these for the kids..they love oreos, cupcakes and Mickey! What is better! Wow these are so cool! 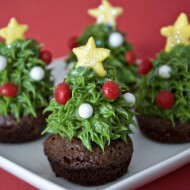 I would love to make them but without a food processor I guess the oreo crushing process would be pretty tricky! Have you seen Bakerella just posted some mickey mouse cake pops today? 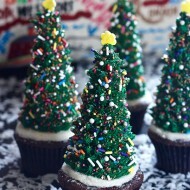 you could make a real cute themed Disney party with those cake pops and your cupcakes!! I just want to tell you that I made these this past weekend for my daughter’s 3rd birthday. She LOVES Mickey and when I was looking for ideas of what to make, I Googled Mickey cupcakes, and your website with this picture was first on the list! It was the perfect idea, and she loved them. So thank you!!!!! I love this idea and want to recreate it for my grandsons 2nd birthday. I am not a baker so I thought I should practice. Good thing, after taking the cupcakes out of the oven and letting them cool, they fall and I have no rounded top. Is there a way to fix this? LOVE the Mickey Mouse cupcakes – too cute for words! Kim – did you use a box mix? Could be they weren’t mixed enough, the cupcake mix and eggs need to fluff. I also recommend letting the batter “rise” a bit before baking! Helps! 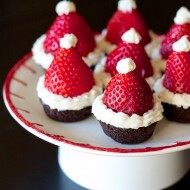 These cupcakes are adorable! 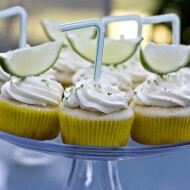 I am going to make them for my son’s first birthday party. He absolutely loves MIckey. My only concern is making the ears. Wont they crumble when you cut them? and I guess I just dont understand the cookie cutter part. Please help! 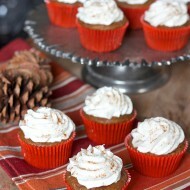 Anonymous — the cutting can be a little tricky, but the cream filling helps keep things together. 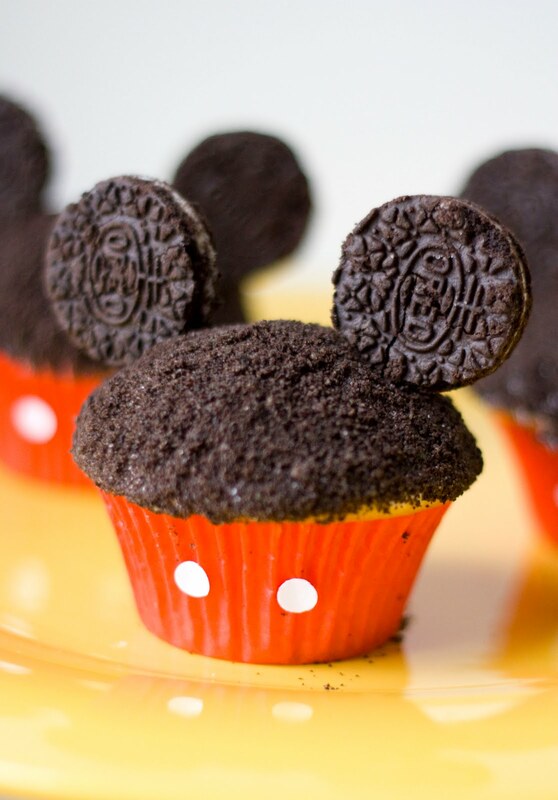 If you’re nervous about it, just use mini oreos — they’re smaller, but still would be cute! what kind of glue did you use to glue the circles on the cupcake cups?? I wanted to make these for my daughter after seeing them on Pinterest. I didn’t look at your post yet and just bought mini oreos. Hopefully they don’t look too unpoportionate. Just got home from WDW 5 days ago and these cupcakes are just perfect. So creative and both WizKid and Mr. Sweet Butter would love these. Ok! I just made them and they are adorable!!! I used 2 rows of regular Oreos in the food processor and had lots left over even after 30 cupcakes. I did get 2 packages of double stuff Oreos and used all of them for the ears. Being thicker, they didn’t break as easy when I inserted the toothpick. 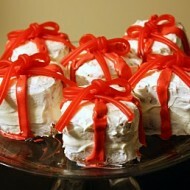 I had some red with white polka dot cupcake liners too so we made minnie as well adding a bow with red decorator icing! I bought pink polka dot cupcake wrappers today. 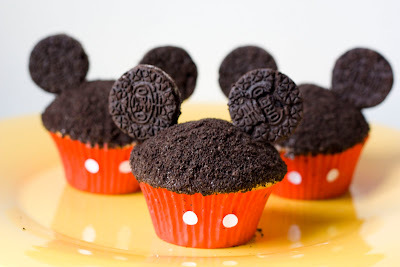 Going to make minnie ones for my daughters 3rd birthday! You could probably use mini Oreos instead of punching out big Oreos, right? How big was the cookie cutter you see for the ears? I am a nanny and I always try to find fun things to do with the kids. I did this yesterday, and it was amazing! they loved it! thanks for the idea! I just made 36 of these for my son’s second birthday party – he loves Mickey! Such a cute idea and so easy. I found that the reduced fat Oreos didn’t crack as much as the regular Oreos when I cut the ears out. hey i am also planning for my son’s 2nd birthday do you have any more idea about mickey mouse stuff and cake pls help me where can i find good and cheap stuff.. If you have other kid-friendly projects, we’d love it if you would submit them. If you would like to display a featured button on your site, you can grab one from the right side bar of your post above. Thanks for a wonderful project idea! Do you remember where you bought your small cookie cutter for the ears? And is it an actual cookie cutter or would I find it under another name?? Thanks! 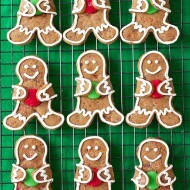 Look for a “mini” cookie cutter, a lot of times they come in sets. Good luck! Does anyone know the diameter of the mini oreos? How much smaller are they than the 3/4 in cutouts made here? Thanks! (big mickey fan) I even have the mickey cookie cutter. I am so seriously hungry now, and that cupcake! Mmmmm…. Pingback: Le TOP 20 Des Meilleures réalisations sur le thème de Mickey Mouse!